Designed to harmoniously attach to Wolf Tooth's B-RAD Mounting Base, the B-RAD Double Bottle Cage Adapter allows you to carry two water bottles in a side-by-side fashion, so you can stay hydrated on longer hauls and trail rides. As a nifty alternative, you can use the B-RAD Double Bottle Cage Adapter to attach one water bottle alongside a Mini Strap and Accessory Mount (sold separately) for greater storage of tools and tubes in remote riding locales. To install, you'll need to purchase a separately available B-Rad Mounting Base (most likely the B-RAD 3 or 4 Base), which attaches directly to standard 64 millimeter bottle cage braze-ons located on your bike's downtube or fork leg. 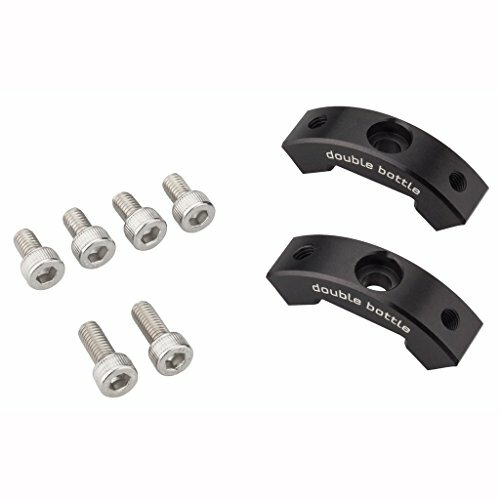 The Double Bottle Cage Adapter is comprised of 6061-T6 aluminum brackets and stainless steel hardware. If you have any questions about this product by Wolf Tooth Components, contact us by completing and submitting the form below. If you are looking for a specif part number, please include it with your message.